We have recently launched our London South Bank University (LSBU) Academy of Sport mobile app. Our app allows users convenient access to services offered at the Academy of Sport, as well as giving our fitness members the opportunity to book onto our group exercise classes directly on their phone. 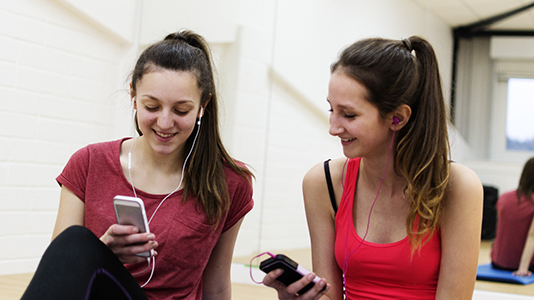 With the ability to share content through social media, the app will be a catalyst for promoting fitness and wellbeing to students, staff and the wider community. In addition to bookings, app users can keep up-to-date with how our student sports clubs are performing, and find out more information on other services offered such as children’s and community activities, courses, and plenty more. Download the app for free now, and have the Academy of Sport in your pocket. With the LSBU Academy of Sport app you always have quick and easy access to book onto your favourite fitness classes. Get up-to-date information, book onto any fitness class, stay tuned with student sports, events, and offers, and receive push notifications for important news. Fitness class bookings: check availability, make a booking, amend a booking and cancel a booking – all on the move. Activities schedule: get real-time access to LSBU Academy of Sport's timetable for classes and other activities, including times, fitness instructors and class description. News and push notifications: instantly get notified of LSBU Academy of Sport news and events direct to your phone. With our app, you’ll immediately know when there are new events or classes, ensuring that you’ll never miss a thing. Community activities: find out about LSBU Academy of Sport’s community engagement and organised activities. Sharing through social media: share fitness classes, news, facility information and offers with your friends and family at the touch of a button. For more information on making the best use of the app, please see our app guide (PDF File 2,708 KB).